It’s 11pm and I just walked in the door. After a full day of work I left my house again at 5pm so that I could arrive at a high school about 25 minutes away in time to sign in and get settled. I left that high school close to 10pm. What was I doing? I was testifying in front of the Study Commission on the Use of Student Assessments in New Jersey. This is the commission that will make recommendations regarding PARCC as we move forward. Tonight close to 200 parents and educators showed up at the hearing. More than 60 of us were on deck to testify. And I have to give credit where credit is due- Commissioner Hespe and the members of the commission sat through all of the testimony. In all that time, there was one person who spoke in support of PARCC. Teachers got up to speak about lost instructional time, parents pointed out that they trust teachers to assess students, and a high school student shared his perspective. I spoke almost three hours into the hearing. My testimony is below. I hope that the commission takes a step back to absorb what they heard tonight before making their recommendation to the governor. My name is Sarah Gross. I am one of 265 National Board Certified teachers in the state of NJ, the 2014 NJ Council of Teachers of English Teacher of the Year, and a National Council of Teachers of English Secondary Teacher of Excellence. I am a published author and a contributor to The New York Times Learning Network who currently teaches high school and previously taught middle school. I’m here today because as a professional and a taxpayer in the state I am severely disappointed by the state’s decisions regarding PARCC testing. First, this is a false narrative. NJ’s schools are consistently ranked as some of the best in the country and the world. The statistic Mr. Hespe cited, that up to 40% of students are not prepared to deal with postsecondary education and work, is from a survey of 2200 adults sponsored by Achieve, an organization that supports PARCC. The survey did not include any elementary or secondary teachers or parents. It was given to high school graduates, almost 50% of whom were not currently registered at a two or four-year college when surveyed, and also included first-year instructors at two and four-year colleges. The full study report from Achieve begins by saying, “Although public high schools are doing a good job preparing many graduates, they are seriously failing a substantial minority”. If that is the case, why are all students in grades 3-11 being forced to take the PARCC exam; why are they forced to be guinea pigs for a major corporation that can’t even tell parents and teachers the passing score? My own high school students frequently conduct research studies and there are strict guidelines that govern the use of human subjects in experiments. PARCC is nothing more than a corporate experiment and oversight is nonexistent. Our students are living, breathing human beings who deserve more respect. Or perhaps Commissioner Hespe was referring to a second study, led by researchers at Johns Hopkins University and the University of Arizona. This 2011 study found that two-fifths of high school students were prepared neither for traditional college nor for career training. But if this is the study the state is using, they must not have read it thoroughly. The researchers determined that standardized testing is not the answer and instead high schools should focus on high standards in academics and career track paths, also known as career and technical education. They suggested that high schools offer more career and technical education to all students, something we are only seeing in certain schools in our state. While New Jersey is lucky to have wonderful schools and teachers we all acknowledge that there are problems in some districts. Many of the problems can be traced back to inequality and poverty. Standardized tests won’t help a student who doesn’t have enough food in their house. Standardized tests won’t result in vibrant classrooms where students read and write everyday, which results in deeper learning. Standardized tests won’t fix buildings that are falling apart and schools that are unsafe. Commissioner Hespe lamented that those at last night’s public testimony did not offer solutions to the problems he sees in our schools. Well, Commissioner, I have plenty of suggestions. My first is to sit down with teachers. Not teachers that are hand-picked by political groups or lobbyists. Come to our schools, visit our classrooms, sit in on a faculty meeting. Meet with those of us who are in the trenches day in and day out. Talk to us about what is working and what is not working. Teachers want to be heard and we have a lot of great ideas. Our state has signed a $108 million contract with Pearson to administer PARCC over the next few years. This does not include the funds spent on technology upgrades necessary for the standardized tests. I promise you that teachers can provide you with ideas for better ways to spend that money; ways that are proven by research to improve student outcomes. A May 26, 2011, National Research Council report found no evidence that test-based incentive programs, such as standardized tests, are working. According to the study, “Despite using them for several decades, policymakers and educators do not yet know how to use test-based incentives to consistently generate positive effects on achievement and to improve education.” Again I ask you, why do we continue to allow the students of NJ to be test subjects for corporations like Pearson? In contrast, a 2013 study by the University of Arkansas shows that culturally-focused field trips field improvements in students’ knowledge of and ability to think critically, display empathy, and develop tolerance. The study, which included surveying 10,912 students and 489 teachers at 123 different schools, concluded that school field trips to cultural institutions have significant benefits, specifically for students from less-advantaged backgrounds. Students from high-poverty schools experienced an 18 percent effect-size improvement in their critical thinking skills. What would our schools be like if instead of spending the month of March taking PARCC students visited the Museum of Modern Art, the planetarium, or the NJ State Museum? And it’s not just field trips that improve critical thinking and promote deeper learning. Our schools need classroom and school libraries, which are vastly underfunded. Research shows that school and classroom libraries improve literacy and help create lifelong readers. There should be 15-20 books per child in classroom and school libraries. In most schools, classroom libraries are funded solely by teachers. Those classroom libraries promote real, authentic reading experiences across genres for students, unlike standardized tests. And school libraries? Take a look around the state to see how many schools have underfunded or non-existent school libraries since the dawn of No Child Left Behind. According to a 2011 study done by the NJ Association of School Librarians, a well-funded school library program is “a cost effective and essential means to prepare students to become reflective learners who are capable of locating, evaluating, and creating knowledge from information found in a variety of formats.” As a teacher, that’s what I want for my students. I want them to think critically, reflect on their learning, and create rather than consume- skills that come from great lessons and not standardized tests. My last suggestion is that the state of NJ advocate for more and better professional development for teachers. Right now, teachers are being pulled out of the classroom to learn how to administer the PARCC exam. This is a waste of valuable instructional time. I mentioned at the beginning of my testimony that I am a National Board Certified teacher. For those who are not familiar with it, National Board Certification is a voluntary program that “strengthens practice, helps students succeed, demonstrates leadership skills, and advances careers”. Research shows that National Board Certification has a positive impact on student achievement. According to the DOE there are 117,803 full-time teachers in the state of NJ. Only 265 are National Board Certified. Maryland, a state that is often ranked near NJ on the “best of” school lists, is home to 2,760 National Board Certified teachers. They also offer compensation to teachers who achieve certification. This is the type of professional development NJ should be promoting, not PARCC training. Commissioner Hespe, those are just a few of the suggestions you would hear from teachers if you took the time to meet with us. According to an article in today’s Wall Street Journal The state Department of Education says the PARCC exams will take about 10 hours of a 1,200-hour school year. I promise you this is not the case. Speak to teachers, learn about the hours and hours of test prep that is being forced on them and then forced on students. Learn about the class time that must be used for infrastructure testing. Learn about the time spent studying a rubric that is not aligned to what students are being asked to do. Learn about the computer labs and laptop carts that are out of commission for the duration of testing, so that non-testing students do not have access to them for weeks at a time. Learn about the days that will be lost to test prep, the life-changing lessons that have been left behind because we need to practice for PARCC. I’m sorry, but “10 hours” is more than a misnomer- it’s a lie. As a teacher, I feel confident that I am speaking for my colleagues when I tell you that we are not afraid of change, not afraid of pushing our students to think deeper, not afraid of the future. But we are afraid of the future these tests are creating. Thank you. When the Morris Award Finalists were named I was very excited. You see, this is one of my favorite awards given each year. The Morris Award honors a debut book published by a first-time author and the short list is always full of exciting titles. This year was no exception. In fact, this year’s list was made up entirely of books I had not read yet! 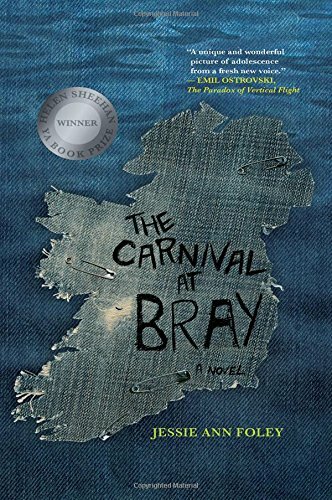 The book that caught my eye immediately was The Carnival at Bray by Jessie Ann Foley. The Irish setting and the 90s music focus were unlike anything else I’ve read and I knew I had to get my hands on it. And the good news is that it totally lived up to my hopes and wishes! Maggie and her family move to Ireland when her mother and her new husband return to his hometown of Bray, Ireland. This is a coming-of-age story that has major crossover appeal. It’s a story of friendship, love, and what it’s like to be a teenager. Maggie is trying to navigate a new life in a new country, a new family dynamic, and a new set of friends. Her voice rings true and will grab the attention of teens and adults alike. Jessie Ann Foley is a voice to watch! Ireland is magical and so is The Carnival at Bray. I’m thrilled that Jessie Ann Foley agreed to an interview today because I was dying to know more about her writing process. She’s a high school English teacher, a debut author, and a Morris Award Finalist! Hi jesse! Welcome to thereadingzone and thanks for agreeing to this interview! Reading your book I was immediately transported back to Ireland. I’ve been there twice and I even got engaged in Dublin! What made you pick Ireland for the setting? Thank you! I love Dublin! As far as my choice of setting: The Carnival at Bray was originally a short story that I wrote after visiting a forlorn carnival fairground in County Wicklow in 2010. I’m Irish-American, but as Maggie learns in the first chapter, that identity can have very little to do with what it means to be actually Irish, and if I had known then that I was setting myself up for the task of expanding it into an entire novel set in Ireland, I might have made things easier for myself and kept Maggie in Chicago. But then, I guess she would never have met Eoin. I’ve been to Ireland several times, but that alone was not enough experience to allow me to write this book. My husband, who is from County Kerry, was a huge help to me. I tortured him with constant, nitpicky questions relating to word choice, slang, and authentic details: What do you call those bales of hale covered in plastic? What is the hurling equivalent of a quarterback? What kind of beverage would a young Irish kid drink if his father took him to the pub? Things like that. If there was a passage that contained lots of dialogue—Eoin’s long monologue about his mother comes to mind—my husband would read it aloud and help me figure out what needed tweaking. I was so nervous for him to read the first draft of the book, because I knew I was going to make ridiculous mistakes. But he was polite enough not to make fun of me. Haha, that’s awesome! The other part of the setting that I loved was the music that pulsed through the background of evey scene. Were/are you a Kurt Cobain fan or did you find your way to him while writing? Did you write to a specific soundtrack? One of my favorite parts about writing is how the story can surprise you: you think it’s going to be about one thing, but then you start to discover it’s about something else. I didn’t know that my novel was going to be about music when I started writing it. But as Uncle Kevin developed into an important character, the musical angle grew with him. I had so much fun going back and listening to all my 90’s music–some of those albums I hadn’t listened to for years. I listened to a lot of Liz Phair’s Exile in Guyville, the Lemonheads, Smashing Pumpkins, and of course, Nirvana, I listened many times to the live album of the Rome concert that is portrayed in the book. It all definitely brought me back–the music of your youth seems to have that power. I barely remember my first kiss. But I’ll never forget the first time I heard Pearl Jam. We clearly have a lot in common. 🙂 I feel like all of my memories are set to music, so I totally understand. Congratulations on being a Morris Award finalist! I am so impressed that you wrote such an amazing book while being a full-time English teacher. As I’m sitting here looking at the pile of grading I have to do I can’t imagine how you did it. What is your writing schedule like? Well, I’m currently out on maternity leave, but my school’s book club is reading the book right now! Some of my former students have read the book, and it was really cool to hear from them about it. Last year, I showed my class the three potential covers of the novel, just to get their input. Their favorite cover was the one that my publisher ended up choosing, so that was really fun! I can imagine! What an exciting time for you and your students! Thanks again for agreeing to this interview. I know I will be waiting with bated breath on the day the award is announced. And just for fun, one last question. What is your favorite food to snack on while you are writing? Those sugar cookies that have like an inch of colored frosted on the top, washed down with an ice cold Diet Coke. I’m a health nut, clearly. Thank you to Jessie Ann Foley for writing an incredible book and agreeing to today’s interview! Be sure to check out the rest of the Morris Award Finalists blog tour this week! You can see the schedule on the Cinco Puntos Press blog. I LOVE the @LtlFreeLibrary Movement! In honor of the 40th anniversary of Tuck Everlasting, one of my all-time favorite books, here is a blast from the past post. Back in 2007 I was teaching 6th grade and Tuck was the first novel I read with my students. In class, we have been doing a close reading of “Tuck Everlasting” for the last few days. We re-read the Prologue and Chapter 1, annotating when necessary. It is so amazing to hear my students say, “Wow! I didn’t even realize that circle had meaning the first time I read it!” I think they are starting to understand the need to sometimes re-read parts of a book, especially when you want to clarify certain points or respond to the book in writing. This is a skill they will need to hone as they move through the middle school and high school and one they aren’t explicitly taught at any grade level. I am having so much fun with it! College Board released sample questions for the new PSAT/SAT: https://t.co/Q1KOtdtz0v Shocker: identical to PARCC. A Kenyan activist critiques the motives of American volunteers abroad.